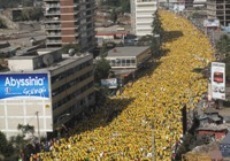 Included on this list is the Great Ethiopian Run, Africa’s biggest road race. Here is what they say. Earlier this week I mentioned that Chung-Yee and are thinking about doing this race in 2012. The elevation is not the 2500 feet I mentioned but 2500 metres! Last night my husband and I went to a performance of the Ethio Fidel Jazz Band who will be playing at the People4kids gala. They had a guest vocalist, Fantahun Mekonnen who along with the renowned Girma Woldemichael on saxophone just blew everyone away. 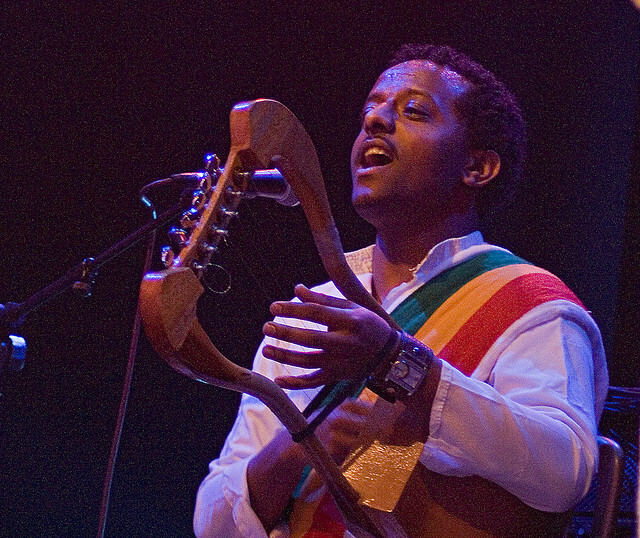 Mekonnen also played the krar a traditional instrument. I’ve been a bit lax lately about tracking my training miles but I’ve been fastidious in updating my ticket tracking spreadsheet. As Gala chair I challenged the committee to try and sell out by Sunday, April 3rd. We have 28 tickets left, if you would like to buy a ticket, donate a silent auction item contact me at people4kids@bell.net — This is going to be a very special evening in support of an excellent cost-effective sponsorship program that enables *some* of the over 1 million AIDS orphans in Ethiopia to go to school. I took today off from running, my second day off this year, as I had done back to back hard days, Thursday and Friday. Categories: Community, Fundraising, Masters Running, Running | Tags: Fundraising, Great Ethiopian Run, Masters Running, People4Kids Gala, postaday2011, Running | Permalink.